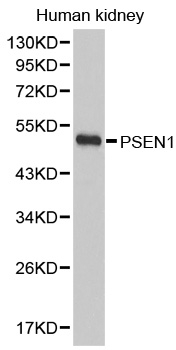 Rabbit anti presenilin-1 antibody recognizes presenilin-1. Presenilin-1 forms part of the gamma secratase complex. Presenilin-1 has roles in the production of beta amyloid as well as Notch and Wnt signaling pathways. Antiserum to presenilin-1 was raised by repeated immunization of rabbits with highly purified antigen. Purified IgG was prepared from whole serum by affinity chromatography.